David Guiles, executive director of Grace Brethren International Missions, sends the following reports from the Third Lausanne Congress on World Evangelization meeting October 16-25 at Cape Town, South Africa. My list of significant conversations continues to span the globe, with meaningful dialogues with fellow followers of Christ from Cameroon, the Philippines, Tanzania, Sri Lanka, El Salvador, Suriname, Ukraine, South Korea, Bangladesh and the United Kingdom. Only 164 countries to go J! Our brief study of Ephesians provided the platform to explore what John identified as dual currents (tensions?) at play during the first days of Cape Town 2010. We live in a world under the wrath of God, and, as a result, a world characterized with extraordinary pain. As evangelicals, are we to focus on alleviating the pain of this life, or upon warning men to flee the wrath to come? While many in this world hate Muslims, God has not changed his feelings toward them as expressed in John 3:16. How do we reach Muslims? First, understand them; then, love them; finally, share the Gospel. It is to our shame that we seek models and methods of evangelism that cost us nothing. Then we find the money to export them around the world. Such a Gospel would not have been recognized by the Apostles. There are no truly closed countries to the Gospel, only countries where we aren’t ready to stand for the Gospel. In every religion of the world, God dispenses mercy at the expense of justice. Where justice collapses, hope collapses. In Christianity, God dispenses his mercy through his justice. From a Muslim Background Believer – Let us not fall into the liberal trap that explains away the cross, nor the marketing trap that softens the edges of the cross, but find fresh ways to raise the cross. The world began in a garden and will end in a city. The diaspora (migration): presents the church with one of its greatest opportunities for ministry today, with many of the ‘hardest to reach’ entering our major metropolitan areas. The effects of relocation often create an unprecedented ‘openness’ to the Gospel. If the diaspora affects 200 million people currently, that number will double within the next 20 years. 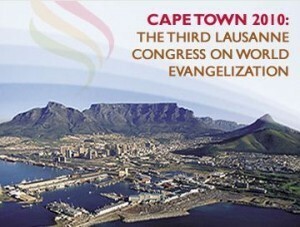 David Guiles, executive director of Grace Brethren International Missons, is participating in the Third Lausanne Congress on World Evangelism at Capetown, South Africa. As the light of global Christianity shines into the darker corners of the North American church, a very unpleasant reality emerges – an idol even greater than our lust for more things. That idol is our calculated passion for security. It shapes our national agenda and governs many of the decisions we make on a personal level. “Safety first” may be a great motto for a factory, but it’s a lousy life verse for a believer. It completely undermines the call to radical discipleship. The world will never be won by those who tread cautiously.